Polishing and cleaning were full time jobs in the 19th century home. If families could afford it servants were employed to do the back breaking work but if not the task fell to the female members of the household themselves. The cleaning task was never ending, many of the fittings and decorative pieces were made of copper or brass, stainless steel had yet to be invented and the heavy materials used to furnish the rooms created large amounts of dust. 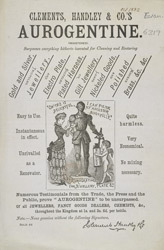 This advertisement for Clements, Handley and Company's aurogentine cleaning cream is clearly aimed at the more wealthy in society as no working class home would have had a suit of armour like the one featured in the illustration.